Integrate the classic Hampton’s design theme with the owner’s taste for a modern flair. A narrow stretch of land between a tennis court and the side property line remained unused and lost in this backyard. This tight space became seemingly more narrow when contending with the 30’-0” side yard setback. The area was flat and creatively uninspiring, but was also a ‘blank canvas’ where we could envision greatness! Our design resulted in the creation of a central masonry courtyard that is framed on both sides with corresponding water features. 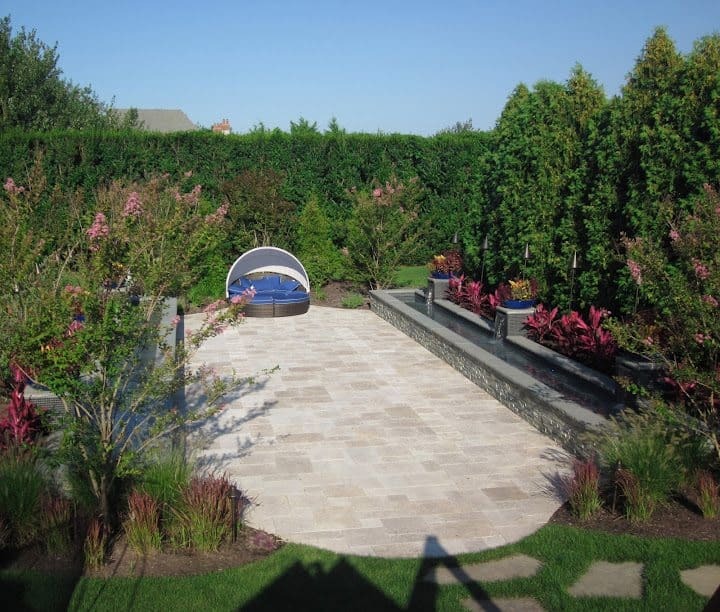 The 20’ x 40’ courtyard is styled in Noce Tumbled Travertine set in a Villa (French) pattern. It is highlighted with a subtle, rectangular inlay using a lighter colored travertine. The courtyard is lengthened with corresponding ‘eyebrow’ or Roman ends. The courtyard is framed by (2) 24” wide x 40’-0” long gunite reflecting pools. The pools are dressed with a timeless East West Stone veneer and capped with traditional bluestone treads. The modern design of each pool is adorned by (3) 24” x 24” x 36” pillars styled in smoked glass tile and capped with bluestone. Each pillar features its own sheer descent waterfall into the pool. The water is then re-circulated through an intricate plumbing and filtration system and controlled from a central automated Crestron System inside the residence. The Crestron also operates the entire low-voltage lighting system that was designed with various ambient settings that influence the mood of the space. The underwater colored lights in the pools rotate in perfect sequence with one another, as light refracts from the glass tiled pillars and illuminates the arching cascades of water from the sheer descents. A row of solid bronze Tiki torches flicker above and shed soft low-voltage light on to the foliage below. Plantings play a major role in the success of this space. Tall, dark evergreens such as: Cupressocyparis leylandii and Thuja occidentalis, provide a dense backdrop around the courtyard. The evergreens limit the field of view and disguise the tennis court, beautifully. In front of the evergreen border are staggered Salix integra ‘Hakuro Nishiki,’ which incorporate a tall, airy layer of color; while showy Cordyline terminalis (‘Hawaiian Ti’) adds drama to the composition as they’re seen rising above the pools. Glossy blue planters decorate each pillar with a display of colorful Annuals. The five blooming pink Lagerstroemia indica ‘Tuskegee,’ provide vertical accents and extend the season into the Fall. A variety of ornamental grasses fill in the areas around the base of the trees. This layered planting scheme offers vibrant colors and intriguing textures that would also attract grazing deer, yet all plant material was chosen to be less than appetizing for these frequent visitors. As sustainability is always our number one priority, all elements were constructed with steel reinforcement and 36” depth concrete footings that meet all NYS and local code requirements. Site. Context. Concept. The ability to holistically execute these three design principles perfectly (and within time-frame and budget) is the work of true Design/Build professionals!